Mother's Day is a fantastic time to enjoy Cape May with your family. Many consider it one of the best weekends of the year to experience. The flowers are in bloom, the weather can be sunny and warms a bit, and usually there are a ton of fun activities and events in town. It's best of what Spring in Cape May has to offer. Our Mom loved celebrating Mother's Day in Cape May with her family. We used to take her to the Madd Batter Restaurant on Jackson Street and order one of her favorites — Chesapeake Eggs Benedict with Hollandaise, hash browns, and Grand Mimosa's (Mimosa with fresh orange juice, on ice, with a shot of Gran Marnier, really tasty). We would always see other families out enjoying Cape May with their Moms and the holiday celebrations really create a nice atmosphere in town. So this year (2013) we thought we'd honor that Mother's Day spirit with a simple guest house special. For a 3+ night stay we will provide a complimentary cleaning service and linen package. That's close to a $400 savings and those services make for a super convenient long weekend trip. 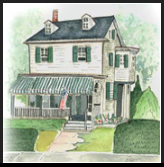 So why not treat your Mom to a fantastic Mother's Day weekend celebration in an authentic Cape May home that sits on Cape May's most historic street. It makes for a great getaway in our wonderful town, spending time with your Mom and family. To secure timing for our Mother's Day special, or inquire, click here. We look forward to hearing from you! These flowers were photographed in front of the amazing Emlen Physick Estate, the beautiful historic landmark and Cape May icon that is a star attraction for tourists, art lovers, and architect aficionados alike. The flower bloom is one of the tell tale signs that Spring has arrived in Cape May. And the Mother's Day weekend is a popular time to be here. The banner image on this page was photographed from underneath the old fashioned clear glass filament lights of Congress Hall's Blue Pig Restaurant, looking towards Cape May's famous Pink House, at sunset, no less. The sky and light on this beautiful Spring evening were perfect!